A latecomer to college, Budd starred with outstanding Lafayette College football teams that went a combined 14-3-1 in his junior and senior seasons. He signed with the Yellow Jackets and played right tackle while splitting the placekicking with Hap Moran. Yellow Jackets went 14-1-2 to finish first in the NFL while leading the league in scoring (236 points) and touchdowns (28). 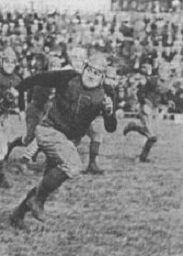 Budd played with the Pottsville Maroons in 1927 and ’28 and went on to perform with independent pro teams, most notably the Millville Big Blue, that sometimes played non-league contests against NFL clubs. Overall in the NFL, he appeared in a total of 40 games and scored 33 points on six field goals and 15 extra points.